Acrospiroma (also known as hidradenoma) is a cutaneous condition, primarily occurring in adult women, that is a form of benign adnexal neoplasm closely related to poroma. 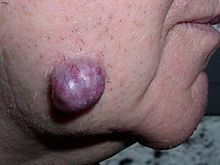 A hidradenoma, here a benign neoplasm of the sweat glands of the cheek. It is not solid but is fluid-filled.